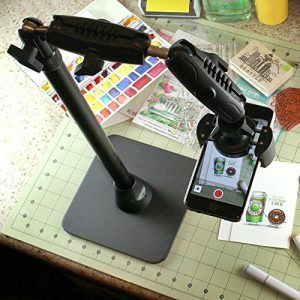 This is a personal “look see” at a product for video vlogs for crafters, artists, cooks, bakers, etc. It holds cell phones and even the GoPro. This table stand does seem to be a “wish come true” for many — like myself who want to show what they’re working on from an overhead shot. This is excellent for video as well as sill shots. The flexible arm gets your phone in the right position to show what you’re doing. There have been some complaints that the stand base shows in their shots. This is not an issue for me. I wanted something sturdy and if a bit of the stand shows, I’m not concerned . . . but I have been able to arrange things so it doesn’t show. I suppose that is a personal thing you’ll need to consider before making a purchase. This stable overhead view phone mount extends upward from 17″ to 29″ on the weighted base. It fits smartphones up to 2 lbs and up to 4″ wide. Arkon’s HD8RV29 Pro Stand now includes 3 flexible shafts to provide additional extension away from the base. It is intended for smartphones with the “claw” to hold it. However, it does come with a 1/4″-20 camera adapter screw. I know one crafter who is able to get her small camera in the “claw” without a problem. I’ve found this Akron Kitchen Desk Table Stand to work for me with my GoPro . . . so I’m happy with it. 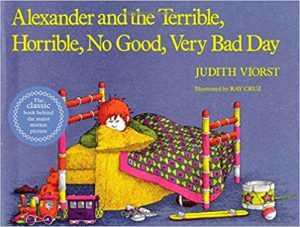 Alexander and the Terrible, Horrible, No Good, Very Bad Day by Judith Viorst and Illustrated by Ray Cruz. This is a fun book for ages 6 to 9 years of age. It’s a good book to bring out when a child is having one of those “terrible, horrible, no good, very bad” days. Before long they are giggling and forgetting all about what got them “down in the dumps”. Even older children like it and remember it. This paperback edition was published July 15, 1987, so it has been around for quite some time . . . and I think it is one that will be around for a lot longer. If you’re looking for a gift that keeps on giving, I’d suggest Alexander and the Terrible, Horrible, No Good, Very Bad Day . . . it all begins when he wakes up with gum stuck in his hair . . . If not, you’re missing out on a lot . . .
I’m probably missing out on a lot, but I’m excited by the perks I do receive. I’ve really gotten into Prime Video. I’ve been able to visit some old TV programs I missed or wanted to revisit. I also like the movies. 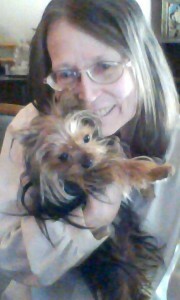 It is a nice way to spend an afternoon or evening. You and only you know if it is right for you. Initially, I had my doubts . . . but once I realized how much I saved on shipping . . . and then the videos . . . Some of them are Amazon productions and they are outstanding!! I’ve found it to be a better deal than the cable movie channels . . . but that’s just me. As I said earlier . . . you decide. 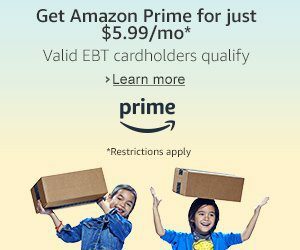 It is worthwhile for you to consider Amazon Prime for all it has to offer . . . maybe not just for you, but your entire household.